People are the one aspect all projects share in common. Without people there would be no projects, with people projects become complex to manage and deliver! People are at the heart of project management, yet their impact is ignored by most books on the subject. This comprehensive tome from Gower, co-edited by experienced practitioners Lindsay Scott and Dennis Lock, rebalances the gap. 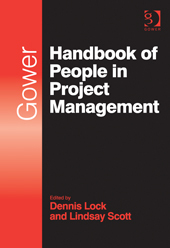 It is a complete guide to the human dimensions involved in projects and has over 60 chapters about project management roles and the people who sponsor, manage, deliver, work in, or are otherwise important to successful projects. Lindsay says: “It’s a book that I think should have been written years ago – something that would sit beside all the other books on project management that focused on techniques, tools and processes. The handbook has been divided into six sections covering management and organisation, people in and around the project environment, improving projects and their people, developing the individual, project staffing and HR issues, and more specialised topics that include NLP, psychology, EI, creativity, social media, stress and spirituality. Contributors have been drawn from around the world and include practitioners, academics and researchers. Each delivers a chapter on their area of expertise, including me. In mine (chapter 25) I look in practical detail at the interpersonal communication skills project managers needs, how to identify the information needs of key stakeholders, overcoming resistance and creating desire for change, and developing a communication route map that takes audiences through awareness and understanding to support and involvement, plus lots of practical activities that don’t need big budgets or resources. Gower is offering a 35 per cent discount to my network, valid until 31 December 2013. Order online at www.gowerpublishing.com quoting code G13HVY35 to obtain your discount. Copies can be shipped around the world. The handbook is also available from Amazon and other booksellers in hardback and pdf versions. The website has lots more about the book including all the authors, chapter titles and a downloadable first chapter. For weekly project communication tips and techniques sign up for Transforming Tuesdays You'll receive practical ideas for keeping people informed about change.